Prof. Dr. Mathias Jopp, Director of the IEP, and Anne Bercio, Project Leader at the IEP, successfully implemented the first workshop at the Verkhovna Rada of Ukraine on basics of the Deep and Comprehensive Free Trade Area (DCFTA). With the EU-Ukraine DCFTA entering into force on January 1, 2016, the series aims at enabling members of the Verkhovna Rada to understand the content, pre-requisites, and legal dimensions of the Association Agreement for sound implementation. 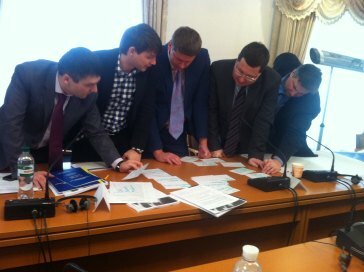 The participants are members of parliamentary committees and secretaries in the Verkhovna Rada. The project is kindly supported by the Federal Foreign Office of the Republic of Germany.